I am working on my first sleeve today. I just finished a 111" long sleeve that I started with 8.5" of fabric. I was told that I need to have a 4" sleeve. However, when I completed it and pinned it to my quilt, the flat portion measures 3.5" but the curved/bowed out portion measures 4.25" in length. I must have done more than a 1/4" seam allowance for the stitching. It was a good two hours of working since I spent a lot of time pressing the fabric to get nice lines since it was 111" long. Do I need to scrap it since it is 3.5" on the bottom and 4.25" on the curved part? My quilts are going to be in a big quilt show in September and I want to make them right since they will be doing a lot of traveling. But in thinking about it, the bottom measure would have to be under 4" so that the top bows out. Could someone please tell me if I am right or wrong? I have extra fabric to make a new one, but I was hoping to save a few hours since I have already put in 60+ hours the past few weeks. Not sure what you mean when you say "flat" vs "curved" portion? And I've heard of quilt shows that will actually measure your sleeve, so I guess it depends on the show. What was the purpose of ironing so you would have nice lines? Sorry, the flat portion is what is attached to the quilt. I ironed it so that I would have a super straight line when I sewed it. The "curved" portion is the part that is away from the quilt. It depend on what they are hanging the quilts with. Since you have no way of knowing if 3 1/2 is big enough, I would add a strip of fabric to your sleeve. It won't look as nice as a solid sleeve but if the sleeve is already attached, it would be easier to add a strip to it then take it off and re-do it. I would cut down one side of the stitched sleeve and add a 2 inch strip to it. I would then French seam the other edge of the long strip to the other side of the sleeve. when I make a sleeve, like in your case, I would cut an 8 1/2 " strips enough to make 110". Sew1/4 "seam and I usually press the seam in to the middle. I place the seam to the back and slip stitch the top and the bottom. I don't like pins because I always stick myself. Our quilt show person does not allow pins. It should be fine. Since it's bowed out it allows plenty of room for the rod to go thru and not bow out the front of the quilt. 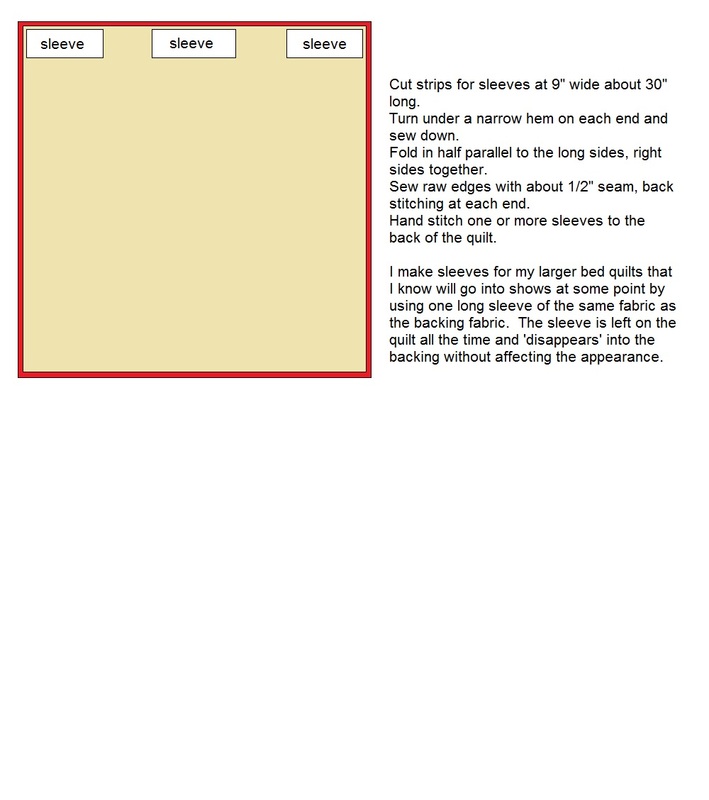 often the 'show' web site will have a link showing you how to make the required sleeve for their show- start there & see what measurements/instructions they have. there are lots of tutorials for making sleeves. some shows are very *picky* and you need to follow the specific instructions for the show you are entering. Over in UK we are told to make to fit a piece of wood which will be 41/2inch deep or 4inch .i would cut along the length and add another piece2inch without seam allowances. The sew seams it could make a pleat check it doesn't show over the top. Does your sleeve fit from edge to edge it should do I order to hang correctly. I have said add extra because with the word rod it sounded round shape. In UK the shape is rectangle and you definately need plenty of room. Good luck in the shows. Half the total should be 4". It doesn't matter that it's not 4" on the part that is sewn down, but it sounds like yours is ¼" too narrow. For that reason, I'd start over. Your sleeve is not yet sewn on, is that correct? Also, I always start with a 9" strip, not 8½", because the back seam needs to be a sturdy ½", not ¼", and it gives you more 'wiggle' room when seaming. Easy, and professional, instructions are offered by Susan Brubaker Knapp. Best of luck. Last edited by ghostrider; 07-07-2013 at 04:10 AM. I would redo the sleeve. If it was a local guild show, it would be fine as it is. I've helped hang quilts whose sleeve barely fit over the poles, even though the instructions said the sleeve should be 4". Your sleeve is only 1/4" too small, and chances are that the difference won't be detected by the show organizers, but still... I wouldn't take the chance. I also start with at least 9". Thanks for all your input! I will make a new sleeve with 9" and give it a good 1/2" seam. Here's another method for sleeving your quilt. While Jan's illustrated method is fine for "at home" quilts (there are many others, as well), if you are quilting for show, it's best to stick with a full width 4" sleeve unless you know something else is required (or permitted). In judged shows, sleeves are subject to judging...and in juried shows, you may not even get in unless you abide by sleeving requirements. The OP was specifically asking about show quilts in this instance. 1) there is less obstruction to the rod if you sew your sleeve seam with the WRONG sides together. That puts the seam allowances on the outside of the sleeve which places them facing the backing of the quilt, never to be seen again and entirely out of the way of the rod. 2) if you fold over a ¼" twice on the short sides before stitching, a double fold, you will not have a raw edge inside the sleeve. Stitch as closely to the folded edge as you can to reduce the fabric lip. It will look neater, wash more securely, and load more smoothly over time. When we were hanging the children's quilts at our guild show last fall, there were several sleeves that were amusing in their form - and completely unusable as there was no way to slide the pole through them. We ended up using lots of safety pins so that they quilts could be hung. I spoke to the girls when we returned the quilts to them, to let them know what we had done - and so that they could improve for the next show. This is not something I would (or could) do for an adult's quilt. At judging a sleeve problem was caught that hadn't been caught at the take-in, and the quilt was sent home so that it could be fixed and returned the following morning. Obviously, this can't be done at a larger show, especially if it is being sent out.